UNESCO Director-General Irina Bokova (left) and Goodwill Ambassador Herbie Hancock kick-off the first annual International Jazz Day in Paris, France. The United Nations today kicked off celebrations for the first annual International Jazz Day with a concert in Paris, which will be followed by another in New Orleans on Saturday, and another at UN Headquarters in New York on Monday. The International Jazz Day, which falls on 30 April, seeks to spotlight the historic influence the jazz music genre has had in connecting people and igniting social change. Born in the United States at the beginning of the 20th century, jazz is rooted in African traditions, draws from European musical forms, and has evolved into various styles across the globe. At the UNESCO General Conference in November last year, the international community proclaimed 30 April as International Jazz Day, with the intention of raising awareness in the international community of the virtues of jazz as an educational tool, and a force for peace, unity, dialogue and enhanced cooperation among people. In her message to mark the day, Ms. Bokova stressed that the values of jazz – freedom, diversity, understanding between cultures and peace – are the same values supported by the UN. “Making the most of cultural diversity is a task we all share,” she said. As part of the celebrations, in addition to the concerts in Paris, New Orleans and New York, others will be held in more than 100 cities around the world including Moscow, Muscat, Havana, and Yerevan. In New Orleans, the birthplace of jazz, UN Goodwill Ambassador Herbie Hancock will be joined by other jazz luminaries in a performance in Congo Square at sunrise. Students and schools from around the world have been invited to play the song “Watermelon Man” along with Mr. Hancock and upload their performances online through YouTube. On Monday evening, UNESCO, along with the Thelonious Monk Institute of Jazz, will host a concert at UN Headquarters which will feature an all-star cast of performers, among them Tony Bennett, Chaka Khan, Angélique Kidjo and Romero Lubambo, as well as Mr. Hancock. Co-hosts include actors Robert De Niro, Michael Douglas and Quincy Jones. Both concerts will be broadcast live on the UN's YouTube page and will be available to the public. Also on Monday, before the concert in New York, the UN Department of Public Information’s UN Academic Impact, in association with the Committee on Information and the Permanent Mission of India to the United Nations, will hold a panel discussion, involving jazz artists, on the theme of ‘Conversations on Unlearning Intolerance: Jazz as a Force for Education and Dialogue,’ and will screen a documentary film, ‘Finding Carlton,’ about jazz’s impact in India. 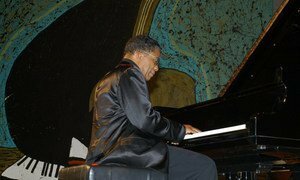 The United Nations Educational, Scientific and Cultural Organization (UNESCO) will designate United States jazz musician Herbie Hancock as a Goodwill Ambassador later this month, the agency announced today.